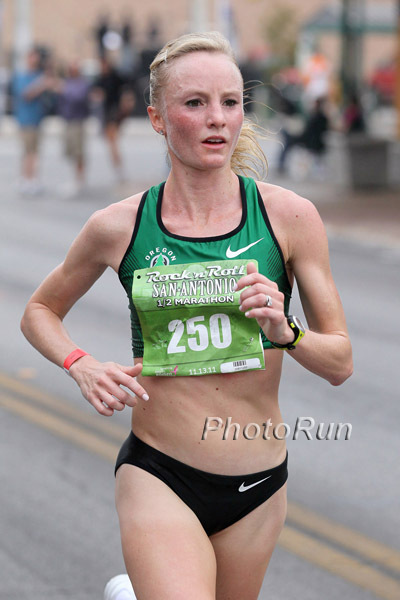 Shalane Flanagan was all business at Sunday’s Rock ‘N Roll San Antonio Half Marathon, taking home the victory as part of her preparation for the upcoming Olympic Marathon Trials. With a goal of cracking 1:12:00, Flanagan cruised to a big win and an even faster time than expected, posting a 1:10:49 — just about two-minutes slower than her PB of 68:37, even while running a largely solo effort with her weekly mileage up in triple-digits. The time gave her a margin of over two minutes over top American marathoner Tera Moody — surely a dark horse candidate at January’s Olympic Trials after taking 5th in 2008 — who placed second in 1:13:23. For all four runners, the half marathon served as a fitness test and race stimulus as they make their respective bids for Olympic marathon berths. Flanagan, Nelson, and Vaughn will race the US Olympic Marathon Trials in Houston on January 14, 2012, while Bairu will attempt to make Canada’s team (which is not determined by a single Trials race) by virtue of his performance in the all-comers Houston Marathon, held the following day. In order to represent Canada, the Swoosh from Saskabush must run under 2:11:29 and be ranked among the country’s top three marathoners. Last year, three men broke 2:12 in Houston, with Bekana Tolesa winning in 2:07:04; in 2010, seven finishers broke 2:11, with 2:13:52 taking eighth.